drink the good stuff! : What was Mouton thinking? 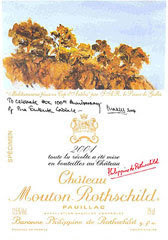 By now you may have heard that Prince Charles was selected as the artist to adorn the top 1/3 of the famous Chateau Mouton-Rothschild wine label. Yes, yes, he is a good water colorist and it looks to be a fine picture, and the fact the Baroness has basically selected a non-artist for the artist label is not what I have issue with. No people, look closely at the picture atop the label. See anything missing. Hmmmm.... HOW DOES THIS RELATE TO WINE OR THE CHATEAU? Oh man, I had to shout that one out. As decanter put it, "The chosen watercolour, of pine trees at Cap d'Antibes on the Cote d'Azur, was not painted specially for the chateau." Isn't that the whole point. I can concede the birthday tribute labels, and who among us does not appreciate the 2000 golden ram? But this choice my friends is just not right and no inscription afterthought about the 100th anniversary of the Entente Cordiale between France and England is going to make it better. To be fair, I also have issue with a number of other Mouton labels that run up against the same problem lest the Prince thinks I am just picking on him. Let's just hope Thomas Kinkade is not up in 2005.